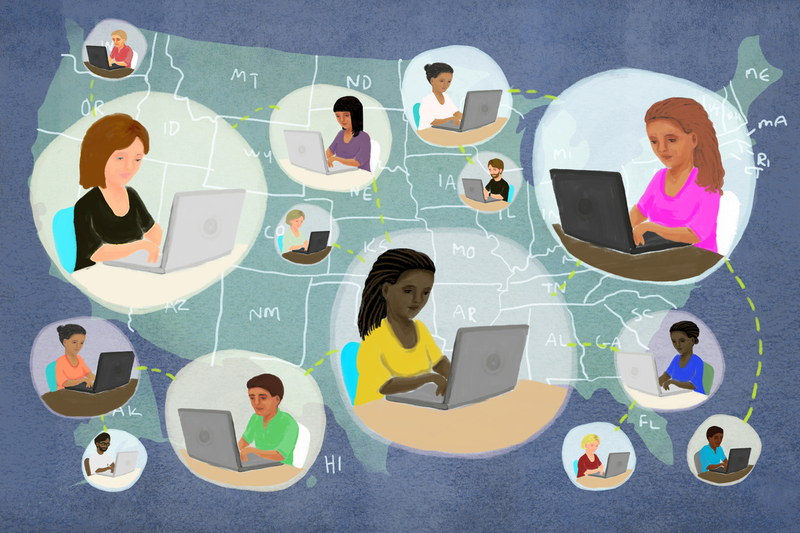 Live From Small Town America: Teachers Who Blog To Stay In Touch : NPR Ed Teachers in remote areas say it's a great way to plug into conversations with other educators. Katie Morrow became a teacher, among other things, because of wanderlust. "I'm going to be a teacher because I can go anywhere in the world," she thought. She's originally from a small town in Nebraska called O'Neill, population 3,700. "In the middle of nowhere, literally," she says. So where did she end up teaching? Right back in O'Neill. She fell in love with a hometown boy and ended up at O'Neill's only public school. It's K-12, with 750 students. Morrow teaches middle-school English; she's also a technology integration specialist. She says she loves Nebraska, but teaching in a small town comes with its own set of problems. A big one is the sense of isolation. "Let's say you're the music teacher in O'Neill, Neb. You're the only music teacher." In 2007, Morrow became an Apple Distinguished Educator and met with other outstanding teachers from around the world. She says she was in awe of their achievements, but also thought, "We're doing good things, too, in O'Neill that people just don't hear about." She started a blog, Teach 4 2 Morrow. Like many educators across rural America, she has tapped into a way to keep in touch with other teachers far beyond her small community. Morrow says her main goal in writing is to shine a spotlight on what teachers in small town America are doing. Unlike inner-city schools, she explains, "We don't have a local news station that can report when my class does this awesome project, so putting it on a blog is an easy way to do it." She's also big on making her students blog. Part of Morrow's job is leading the school's one-to-one initiative, in which every student has a laptop to use throughout the day. She assigns her seventh- and eighth-graders to blog about their everyday lives and about the projects the class is working on. Most of the kids who grow up in O'Neill "never leave a two-hour radius," she says. "Bringing the technology to them and allowing them to bridge that outer part of the world that they aren't exposed to normally is huge." Sarah Hagan, recently featured in our 50 Great Teachers series, grew up thinking she was from a small town in Oklahoma until she began teaching in Drumright, Okla., which has a population of less than 3,000. "There are tinier towns than I realized," she jokes. "I didn't know what to expect, honestly. I always assumed I'd go work at this school where I would have this fabulous math department, and I'd collaborate with them. And then I ended up in a tiny town where there's one other math teacher." Hagan's own love of teaching was born in part from reading a math teacher's blog when she herself was in high school. It was called Math Teacher Mambo by Shireen Dadmehr. "I just became amazed," Hagan recalls. "I thought, 'This is the way I want to teach.' For the rest of high school and college I read all the teacher blogs I could get my hands on." She still follows about 400 different math blogs for ideas. One of her favorites is Kalamity Kat, by Megan Hayes-Golding, based in Atlanta, which Hagan says gave her the idea to ditch textbooks and have students create their own manuals. Hagan writes her own very successful blog, Math = Love, part of the Math Twitter Blogosphere, on which she says she has met wonderful friends — and her boyfriend. After learning so much from blogs herself, Hagan says, "I felt like I should give something back to the community I'd been stealing ideas from." But for her, it's about more than just exchanging ideas: "It reminds me that I'm not alone." "There's two traffic lights," is how Katherine Sokolowski describes Monticello, Ill. She teaches fifth-grade language arts there, in a school that serves adjacent towns as well, with about 120 kids per grade. First, she felt that if she wanted to be a language arts teacher, she should be willing to challenge herself to write. Second, and most importantly, she felt the conversation about teaching in America was too negative. "It's easy in the media to shed a negative light on the state of our education system," she says. "But there's so much good happening across the country." "It's not all rosy" Sokolowski clarifies. For example, she debates other teachers on her blog about issues that concern her, like standardized testing. She gives advice about how to connect with difficult students. And she writes about the bad days, too. Like the time her class came back from a break and only half of the students had read their assigned books. She says the response from her fellow teachers always brightens those bad days. "One commenter told me, 'It's like we all live in the same area.' "
And there's one unexpected reward from her blog: a closer relationship with students and parents in Monticello. Even though she's in a small town where relationships are more intimate, Sokolowski says students and parents read her blog and get to know her better. For example, her students know from her blog that she's scared of flying. So when she had to travel recently, kids were checking in to make sure she was OK. These rural teachers say there's a definite urban bias in the teaching blogosphere. "Most of the blogs I read are either people teaching in the suburbs or teaching in the inner city," Hagan says. That leaves out issues that are unique to teaching in remote locations, like the nature of bullying in a small town, where everyone has known each other for generations. "By the time [these kids] get to high school, bullying becomes a real issue," Hagan explains. "They know how to push each other's buttons exactly." It's an issue she finds answers to locally, not online. "I feel like that's something I speak to my actual colleagues about, because they really understand the environment we're working in. A lot of my colleagues have worked here for 25 years. A lot of the kids I have now, they taught their parents. They have a lot of understanding of the area. "